The Arbor Westmark Camber is their modern mostly camber take on the rocker Westmark. It’s got a little more pop, stability but it’s missing the float that the Rocker Westmark Has. Conditions: Everything from soft leftover Sierra Powder to harder spring conditions. Approximate Weight: Feels normal. Nothing too light or too heavy. Just normal. On Snow Feel: In a lot of ways, it feels a lot like the Rocker version except it feels more stable under foot one footing and flat basing. The Arbor Westmark Camber has a lot of good things going for it with this new mostly camber shape. It acts just like camber except it doesn’t catch like camber and our only complaint is it floats like camber. Flex: Not quite as buttery as the rocker version but very doable. If you are used to buttering a camber board then this will be fine but it will take more work if you are used to boards with rocker in it. Turn Initiation: Kind of slow but a good slow edge to edge. Easy to skid a turn and easy to move it around but just not one of those ultra quick turners. It likes to go straight. Carving: Huge improvement over the Rocker. It’s not perfect and it’s a small twin but it carves really well for what it is. Powder: The system camber tech only lifts the last part of the effective edge so it doesn’t catch but it’s not going to help in powder. I’d much rather be on the rocker Westmark in powder. Speed: Rides big for the size and not bad at all. There is much more mountain ability than you would think when it comes to this board. Uneven Terrain: Easy to turn through bumps but nothing great. Edge Hold: Same great edge hold as the System Rocker version but it’s not really more edge hold due to the lifted sides at the end of the effective edge. Switch: Just like all twins when centered. Very easy and only a little behind an asymmetrical board. Jibbing: We all felt it was a good but not great jibber. Pipe: No pipe either but seems like the camber would help it drive better from wall to wall. Jumps: Love the way this pops off the tail. The Rocker version pops just as well between the feet but it’s much more fun to load it up on the tail or nose. The one thing is that loading up on the nose or tail edge is it can sometimes hit the lifted area and become a bit washy. it’s best to ollie or nollie off the center of the tip/tail instead of load off the edge. This is a problem for some but not for others. It’s the one part of the board that gives you a feeling similar to the TBT boards from the Bataleon/Lobster family. You feel camber throughout and then suddenly it feels like a rocker board and washes on you. It takes some time to adjust but after a while, you can make it work. 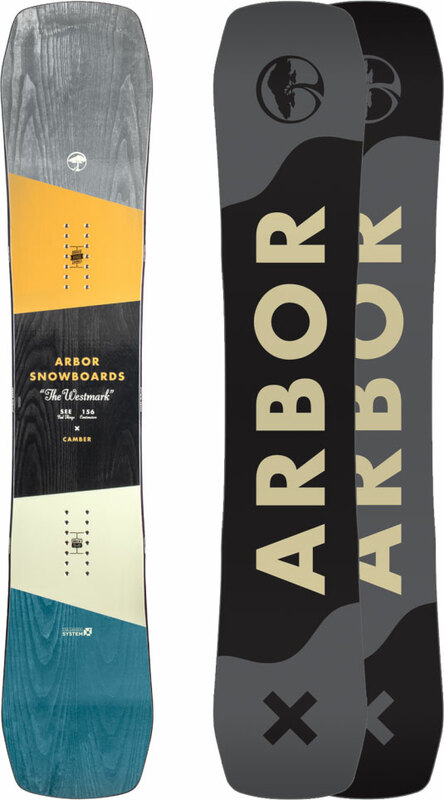 So as long as you have something else that floats better in powder the Arbor Westmark Camber is a great board for the price to play in the park but also ads good turning to the repertoire. We try to get as many images of the Arbor Westmark Camber, but forgive us if they're not all there.